Sure to create a fun and friendly atmosphere in any location, these commercial quality machines are available as a counter-top model or with the matching trolley. 4, 6, or 8 ounce kettles. Easy to use and Maintain. Old-maid Drawer for un-popped kernels. Stainless Steel Food-zone for easy cleaning. 20 mil anodized non-stick kettles. 21w x 18d x 34h. 38w x 23d x 33h. Quarts per hour based upon a 40:1 expansion ratio on popcorn. Dimensions of a Popper on a Trolley: 23d x 38w x 67h. All Poppers ETL tested to standards: UL 197 (9th Edition), NSF 4, and CSA C22.2 NO 109 (M1981). 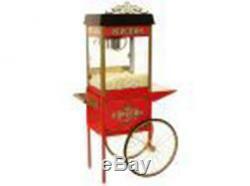 The item "POPCORN MACHINE POPPER STREET VENDOR 6 11060/30010" is in sale since Friday, December 26, 2008. This item is in the category "Home & Garden\Kitchen, Dining & Bar\Small Kitchen Appliances\Popcorn Poppers". The seller is "concessionobsession" and is located in Ames, Iowa.